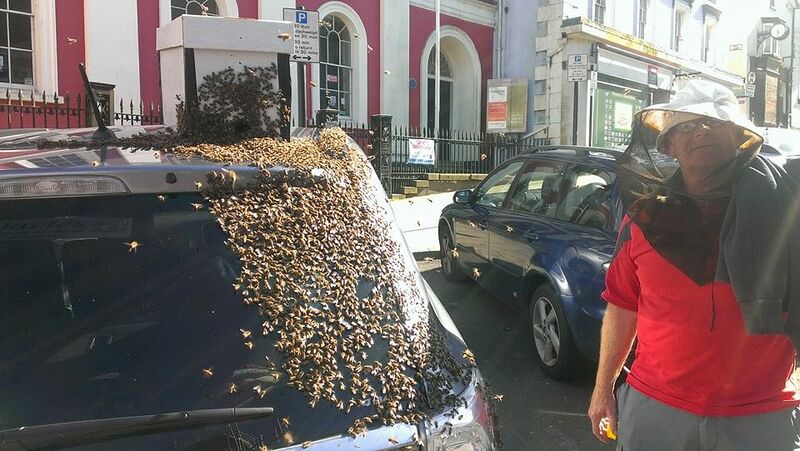 A woman in Wales was harassed by a huge swarm of bees on her car for two days after she apparently snared their queen on her drive home from a nature reserve. Mrs Carol Howarth, 65, was shocked to find a swarm of over 20,000 insects covering the back end of her silver Mitsubishi Outlander. A team of three beekeepers, a national park ranger and members of the public helped to capture and contain the swarm inside a cardboard box while Mrs Howarth was away shopping. The incident occurred shortly after she had parked her car in the town centre of Haverfordwest, West Wales, at lunch time on Sunday (May 22), CNN reported. Speaking about her "incredible" ordeal on Tuesday, Mrs Howarth told The Telegraph newspaper she had "never seen anything like it". The sight of thousands of bees on the car boot caused many passers-by to stop and take pictures of the spectacle. In a pun-filled Facebook post, Pembrokeshire Coast National Park ranger Tom Moses called it a "Bee-rilliant swarmathon". He said a "drunk bloke" from a nearby pub got stung after attempting to sweep the bees off the car with his bare hands. Concerned that the insects might be destroyed with pesticide, Mr Moses contacted the Pembrokeshire Beekeepers Association (PBA) for assistance in tackling the swarm. "I was a little bit concerned, with it being in the middle of town outside a pub, that someone might do something stupid and get hurt or do something stupid and hurt the bees," he said. "I had seen swarms before settle on things like this but never one as large as this. It was quite a thing to see - certainly a 'wow' moment." But the drama did not end there. After returning to her car, Mrs Howarth drove home believing the problem had been resolved - only to discover on Monday morning that the swarm had returned. She was then forced to contact the beekeepers for a second time, who finally managed to remove the bees for good that evening. PBA official Roger Burns said: "It is possible the queen had been attracted to something in the car - perhaps a sweet or food in the car. "I brought over a cardboard box and carefully brushed them into there as quickly as possible as I was aware it was a big swarm in the middle of the high street. "I got about 15 or 20 stings for my trouble. I then left the cardboard box on the roof while we waited for the last few hundred bees to leave the boot." With the queen still not found, Mrs Howarth remains puzzled by the bees' behaviour. She said: "I still don't really understand why because they couldn't see the queen anywhere. Perhaps they just like the heat of my car."